It's one of those so-called facts that everyone knows: Bram Stoker's character Count Dracula was loosely based on Vlad the Impaler. But while there's no doubt that Stoker took the name from Vlad III's patronymic, it's doubtful that the Impaler was actually the basis for the famous vampire. Who Made The Vlad-Dracula Connection? It certainly makes sense that scholars and other readers have connected Count Dracula with the Wallachian warlord Vlad III, nicknamed "Vlad Tepes" or, in English, "Vlad the Impaler." After all, Vlad III was a member of the House of Drăculești, and is one of a handful of historical figures whose title is rendered as "Voivode Dracula" in English-language texts. And the fictional Dracula does share one key biographical detail with his historical namesake: they both fought against the Turks during their mortal lives. But how did these two connections turn Vlad III into the supposed basis for Count Dracula? Stoker's son, Irving Stoker, said that his father claimed Dracula had its genesis "in a nightmarish dream after eating too much dressed crab." After all, the best gothic novels were supposed to come from nightmares—just look at Frankenstein. Wherever Stoker got the initial idea to write a vampire story, Dracula was the product of a great deal of research and imagination. For a long time, that research process was shrouded in mystery. Florence Stoker sold her husband's working notes for Dracula after his death in 1912, and they were lost to scholarly view until 1972, when Dracula scholars Raymond McNally and Radu Florescu discovered them in the Rosenbach Museum & Library in Philadelphia. This means that, for decades, much of Stoker's writing process was left to speculation. And it was in that speculation that Vlad III morphed from Count Dracula's possible namesake to the character's full-fledged inspiration. Dracula scholar Elizabeth Miller's book Dracula: Sense and Nonsense provides a fascinating history of Dracula scholarship as Miller debunks many of theories and misconceptions about the work that have since become accepted "fact." The tone of the book is exasperated, but that in no way detracts from Miller's careful parsing of fact and speculation. Miller notes that the notion of Vlad III as the model for Count Dracula emerged in 1958, with Basil Kirtley, who asserted that, without question, the biography that Abraham Van Helsing gives for the fictional Count Dracula is that of the Wallachian voivode. Similar claims are echoed by Maurice Richardson, Harry Ludlam, and Grigore Nandris. But the book that popularized the Vlad-Dracula link is McNally and Florescu's 1972 In Search of Dracula, which they wrote and published before their discovery of Stoker's notes. It's telling that, years later, both McNally and Florescu eventually stepped back from their one-time claim that Vlad III and his supposed atrocities actually inspired the wicked Count. So how did this all happen in the first place? In the absence of Stoker's notes, scholars sometimes invented their own scenarios for how Stoker chose Dracula as the name of his vampiric villain. One popular theory surrounded Arminius Vambery, a Hungarian professor with whom Stoker was acquainted. In April 1890, Stoker and his friend and co-worker, the actor Henry Irving, dined with Vambery after a performance of "The Dead Heart." (Stoker was the business manager at the Lyceum Theater, which Irving owned.) Many have imagined that this dinner involved Vambery regaling Stoker and Irving with tales of Vlad Tepes and his atrocities, and that these tales set Stoker's imagination aflame. "Thus when we find the habitation of this man-that-was, we can confine him to his coffin and destroy him, if we obey what we know. But he is clever. I have asked my friend Arminius, of Buda-Pesth University, to make his record; and, from all the means that are, he tell me of what he has been. He must, indeed, have been that Voivode Dracula who won his name against the Turk, over the great river on the very frontier of Turkey-land. If it be so, then was he no common man; for in that time, and for centuries after, he was spoken of as the cleverest and the most cunning, as well as the bravest of the sons of the 'land beyond the forest.' That mighty brain and that iron resolution went with him to his grave, and are even now arrayed against us. The Draculas were, says Arminius, a great and noble race, though now and again were scions who were held by their coevals to have had dealings with the Evil One. They learned his secrets in the Scholomance, amongst the mountains over Lake Hermanstadt, where the devil claims the tenth scholar as his due. In the records are such words as 'stregoica'—witch, 'ordog,' and 'pokol'—Satan and hell; and in one manuscript this very Dracula is spoken of as 'wampyr,' which we all understand too well. There have been from the loins of this very one great men and good women, and their graves make sacred the earth where alone this foulness can dwell. For it is not the least of its terrors that this evil thing is rooted deep in all good; in soil barren of holy memories it cannot rest." Some scholars have taken this to mean that Stoker learned from the real Arminius Vambery what Van Helsing learned from his friend Arminius. The truth is, we don't know what transpired at that dinner, nor do we know if Stoker and Vambery ever corresponded. Another piece of speculation surrounds the British Museum, which at the time, had four pamphlets that contained information on Vlad III, but there is no evidence that Stoker actually read any of them. And then there is Vlad III himself. After all, wouldn't a figure known as "the Impaler" make a perfect vampire? The number of movies that treat the life of Vlad Tepes as Dracula's backstory are an indication of just how neatly the historical warlord and the fictional vampire fit together in some people's minds. Some scholars have argued, quite bizarrely, that the absence of pertinent details from Vlad Tepes' life and legends in the text of Dracula is somehow evidence of Stoker's knowledge of the tales and his desire to explicitly fictionalize them. But what about the impaling? It was already a common to stake vampires in folklore and contemporary literature. The fact that beheading is given as a method of killing vampires when Vlad III himself was beheaded after falling in battle? That particular vampire-killing method appears in a book of Transylvanian superstitions that we know Stoker read. The fact that Vlad III was born in Transylvania? Transylvania was a popular exotic locale in Gothic fiction. (Anyway, why would Stoker base his character on a Wallachian rule and then place him in Transylvania?) Some people think the two figures look alike, although that's a bit dubious. Some of the connections scholars have made between the text of Dracula and the life of Vlad III are real stretches. McNally and Florescu suggested at one point that a passing reference to Nuremberg is a deliberate name-checking of the place where Vlad III's father became a member of the Order of the Dragon. Why Did Bram Stoker Really Choose The Name Dracula? The truth is, there's no evidence that Bram Stoker was even aware of the name Vlad III—much less that he was called "Vlad the Impaler." Miller warns that we can't assume that Stoker's notes are the end-all, be-all of the creation of Dracula, but they do provide the only factual information we currently have about Stoker's research. And the notes tell us exactly where Stoker got the name "Dracula." While in Whitby in the summer of 1890 (after, it should be noted, his much-discussed dinner with Vambery), Stoker came across a copy of William Wilkinson's book An Account of the Principalities of Wallachia and Moldavia. We know that, because he copied sections of the book into his notes. Wilkinson's book contains references to multiple voivodes named Dracula, and some of the sparse details on one such Voivode Dracula make it into Stoker's text: that he crossed the Danube to attack Turkish troops and had some success. That's it. There is no reference to a "Vlad," no mention of a nickname Tepes or "the Impaler," no detailing of his legendary atrocities. So why did Stoker choose that name, Dracula? Well, we can infer that from his own notes. He copied information from a footnote from Wilkinson's book that read in his own notes, "DRACULA in Wallachian language means DEVIL," with those capital letters. The footnote explained that Wallachians gave the name "Dracula" to people who were especially courageous, cruel, or cunning. Stoker chose the name, it appears, because of its devilish associations, not because of the history and legends attached to its owner. This is the only reference to the historical Voivode Dracula that appears in Stoker's notes. Is it possible he knew more? Sure, it's possible. But this all we know for certain. The fact is, there is probably no one single model for Dracula. Numerous scholars have suggested that the magnetic Irving provided the model for Dracula's mesmerizing personality, but this is, again, speculation. Stoker started with the idea that he wanted to write a vampire story, and his character changed and grew with Stoker's research and imagination. With the discovery of the notes, we know a great deal about where Stoker's understanding of vampire lore came from. He consulted numerous books on European superstitions. Plus, vampires already existed in Gothic literature in tales like John Polidori's 1819 "The Vampyre" and Joseph Sheridan Le Fanu's 1871 Carmilla. And Stoker invented some new powers and weaknesses for his count. Through Stoker's notes, we can also see how the novel changed over time. Originally, the count wasn't from Transylvania at all; he was from Styria in Austria. And it appears that before he came across the name Dracula, Stoker was calling his vampire "Count Wampyr." (The pages that reference "Count Wampyr" are undated, but in some places, Stoker crosses out "Wampyr" and replaces it with "Dracula.") Like so many fictional characters, Count Dracula is an amalgam, a mix of information that Stoker found interesting and ideas he developed along the way. Dracula isn't even representative of one Eastern European state; he's a pinch of Transylvanian folklore (filtered through English writers) with a Wallachian name and a feudal estate straight out of English Gothic literature. Vlad the Impaler is the "real" Dracula in that he is a real historical figure who bore the name Dracula. Beyond that, little else connects him with the fictional count. To call him the "model" for Dracula is an exaggeration. But the idea that Vlad the Impaler is the historical basis for Dracula has become so pervasive, that it has invaded our current Dracula literature. Francis Ford Coppola opened his 1992 film Bram Stoker's Dracula in 1462 with Vlad Dracula summoning the powers of darkness in the wake of his wife's suicide. 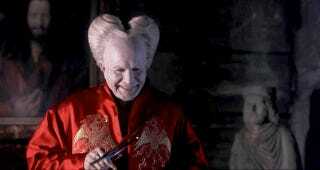 Documentaries about about the "true story of Dracula." And, of course, there's the recent film Dracula Untold, which purports to be Count Dracula's origin story, explaining how Vlad the Impaler became a vampire. In our popular consciousness, the Vlad-Dracula connection has taken on a life of its own, so that Vlad III has become pop culture's Dracula, regardless of what Bram Stoker originally intended.